From “America’s librarian” and NPR books commentator Nancy Pearl comes an emotionally riveting debut novel about an unlikely marriage at a crossroads. George and Lizzie have radically different understandings of what love and marriage should be. George grew up in a warm and loving family—his father an orthodontist, his mother a stay-at-home mom—while Lizzie grew up as the only child of two famous psychologists, who viewed her more as an in-house experiment than a child to love. Over the course of their marriage, nothing has changed—George is happy; Lizzie remains…unfulfilled. When a shameful secret from Lizzie’s past resurfaces, she’ll need to face her fears in order to accept the true nature of the relationship she and George have built over a decade together. With pitch-perfect prose and compassion and humor to spare, George and Lizzie is an intimate story of new and past loves, the scars of childhood, and an imperfect marriage at its defining moments. Nancy Pearl is known as “America’s Librarian.” She speaks about the pleasures of reading at library conferences, to literacy organizations and community groups throughout the world and comments on books regularly on NPR’s Morning Edition. Born and raised in Detroit, she received her master’s degree in library science in 1967 from the University of Michigan. She also received an MA in history from Oklahoma State University in 1977. Among her many honors and awards are the 2011 Librarian of the Year Award from Library Journal; and the 2011 Lifetime Achievement Award from the Pacific Northwest Booksellers Association. She also hosts a monthly television show, Book Lust with Nancy Pearl. She lives in Seattle with her husband. GEORGE AND LIZZIE is a fresh, sweet, funny, and completely charming love story between two people, two families, and two unlikely paths in life, which somehow find their way to each other. To read this novel is to see family, love, and life in a new light. As sparkling as Prosecco, as jubilantly quirky and inventive a love story as you could ever want, and a jigsaw puzzle you never want to finish. If I could marry a novel, this wise, witty and rapturously inventive book would be it. Nancy Pearl understands the desperate, confused, needy heart that beats under the surface of even the most dysfunctional of relationships, and exposes it with wit and genuine love. Oh, and you’ll never think about football the same way again. GEORGE AND LIZZIE overflows with humor and heart, with quirks and eccentricities, with unforgettable characters….Her story daringly and playfully jumbles time and convention, gathering heft and humor as it unfolds. The end result is an irresistible debut by a born storyteller. Read GEORGE AND LIZZIE. This smart novel has a smashing premise, an engaging cast of characters, and a voice that propels you from first page to last with its wit, insight into secrets, families, and football, and its unrelenting energy. GEORGE AND LIZZIE is an unusual story about a marriage, except that really it’s a story about growing up, except that really it’s a story about a cast of uncommon, bewitching characters I could have happily read about for a month. It’s smart, funny, warmly sketched, cleverly put together, engagingly told, and sums to something wonderful and unexpected. I will be recommending it unrelentingly to everyone I know. Pearl dramatizes a complicated and deeply illuminating union of opposites and conducts profound inquiries into the self, family, empathy, and love. The result is a charming, edgy, and many faceted novel of penetrating humor and resonant insight. Nancy Pearl has long been a bright light in the literary world—what a delight to bask in the glow of her debut novel. 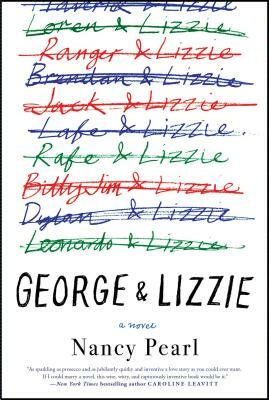 GEORGE AND LIZZIE is a richly absorbing portrait of a perfectly imperfect marriage; a wryly observed story of family, love, and absurdity; and a deft consideration of the moments that shadow and shape our lives, and just might take on lives of their own. [A]n homage to true love, painful childhood experiences, and emotional scars that last a lifetime. It’s a story of forgiveness, especially for one’s self….Extraordinary. With eccentric characters, relationship drama, and a vivid sense of place, this Anne Tyler-esque debut novel is sure to interest and please Pearl’s many fans.